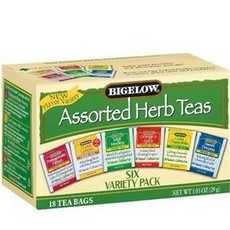 Enjoy Bigelow 6 Assorted Herbal Teas. Pomegranate Pizzaz; Mint Medley; I Love Lemon; Cozy Chamomile; Orange & Spice; Sweet Dreams. Each Tea Bag Is Individually Sealed In An Airtight Packet To Ensure Your Full Enjoyment. No Caffeine. For Three Generations, The Bigelow Company Has Been A Family Business. Founded In 1945 By Ruth C. Bigelow, There Has Always Been One Or More Members Of The Bigelow Family Making Sure That Each New Tea We Create Is Truly Different And Delicious. Our Goal Is To Give You The Very Best Cup Of Tea Possible. So Put On The Kettle, Sit Back And Enjoy A Relaxing Cup Of These Wonderful Bigelow Herb Teas. This Bigelow Herb Tea Assortment Has 3 Tea Bags Each Of These 6 Blends: 1) Pomegranate Pizzaz 2) Mint Medley: A Refreshing Blend Of Peppermint And Spearmint - Its Lively Flavor Refreshes Anytime. 3) I Love Lemon: A Year-Round Valentine For Every Who Really Loves Lemon. Delightfully Refreshing. 4) Cozy Chamomile: As Soothing As A Field Of Daisies, Cozy Chamomile Herb Tea Is A Wonderful Way To Unwind And Relax Any Time Of Day. 5) Orange & Spice: A Delightful Blend Of Orange And Spice That Will Add Something Special To Your Day. 6) Sweet Dreams: A Relaxing Blend Of Chamomile And Hibiscus Flowers, With A Milk And Soothing Flavor. Blended And Packaged In The Usa. (Note: Description is informational only. Please refer to ingredients label on product prior to use and address any health questions to your Health Professional prior to use.